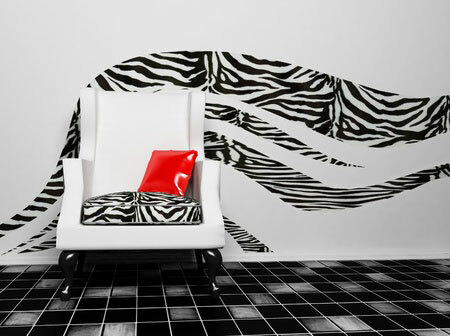 Decorating your home with a combination of black and white can make for a striking look. If there is a part of your living space that seems a little too predictable in its design or could just benefit from the addition of a focal point, then consider implementing this color scheme into your floor. A checkerboard layout, while a classic look, is not your only option when trying to pull off this color sequence. With a little creativity and an open mind, you can give your floors a fresh and fashionable makeover. Instead of the well-known solid colored square design, try a fun geometrically shaped pattern tile. It will be a welcome and unanticipated look upon entering the room. To make sure that it is the star of the show, keep decor simple but functional. You want to draw the eye downward while also making sure that you do not sacrifice the purpose of the room. Not all black and white floor enhancements need to be installed. Simply adding an area rug with these two colors beneath a glass table will give guests pause to look through it. Be sure that there is a clear view of the rug’s design so that it can be properly showcased. The pattern is up to you: chevron stripes, zebra print or even an abstract floral are all great options. You want your personality to shine through, so be bold! Vinyl flooring is a great choice as well. Modern vinyl has a wonderful variety of available patterns to make the process easy for you. From herringbone to damask, no idea is out of reach. More subtle patterns are available as well for more subdued tastes. That’s what makes this color combination fabulous: it can work for everyone! Finally, if you want to keep your colors separated, try dark stained hardwood flooring that leads into a room full of white tile. You can still enjoy the look that these two colors create without needing to pepper them together throughout the same floor space.